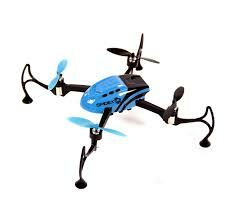 A 3D-capable LED-equipped RTF micro quad that'll guide you through stabilized hovering to inverted flight and full 360deg flips, day or night! Go from normal to inverted flight at the click of a button. Three rate settings to suit your skill level. Available in two bright colour schemes â€“ red and blue. Bright LEDs aid orientation and allow night flying. 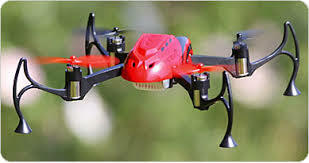 6-axis control system helps to provide steady, level flight. 1 x 100% factory assembled Spidex 3D micro quadcopter. 1 x 2.4GHz 4-channel transmitter. 1 x 300mAh 1S 3.7V Li-Po battery. 1 x Set of spare propeller blades. 1 x Set button-style transmitter stick grips. The Ares Spidex 3D is the perfect micro-size quad to help sport pilots experience 3D flight. An advanced 6-axis flight stabilization system provides the control needed, whilst three different rates of 20%, 60%, and 100%, allow pilots more manoeuvrability with each step so you can expand the capability of your Spidex 3D as your flying skills grow. When you're ready to try inverted flight, just the click of a button flips you from normal to inverted flight and the advanced flight software makes flying inverted easy by automatically adjusting the controls so you can fly with the same stick movements inverted as you would in normal flight. And switching from 180Â° flips to 360deg flips is as simple as another click of a button. The Spidex 3D comes in your choice of two brightly coloured trim schemes with matching LEDs that help provide easy orientation in flight. Plus, the translucent finish on both colour canopies allows LED light to shine through so you have the visibility you need to enjoy 3D flying fun in the dark!